The America’s Cup World Series came to an end over the weekend (November 18-20) with Land Rover BAR winning in Fukuoka to seal first place overall. With six months to go until the America’s Cup Qualifiers get underway in Bermuda, we’ve been looking back at the best moments from the World Series. The America’s Cup World Series came to an end over the weekend (November 18-20) with Land Rover BAR winning in Fukuoka to seal first place overall. With six months to go until the America’s Cup Qualifiers get underway in Bermuda, we’ve been looking back at the best moments from the World Series. The series began in Portsmouth back in July 2015, with the America’s Cup returning to the site of the original 1851 race. Poor conditions and the cancellation of the second day’s racing failed to dampen the enthusiasm of the crowd of almost 100,000 spectators, including the Duke and Duchess of Cambridge. Portsmouth 2015 saw Land Rover BAR get off to a great start, winning the weekend overall with first place in Race 1 and second place in Race 2. Twelve months later, the America's Cup returned to Portsmouth and Land Rover BAR came out on top once again to put them top of the overall leaderboard. 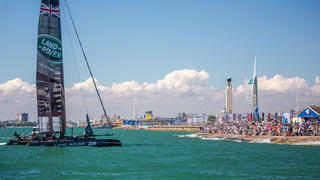 The series began in Portsmouth back in July 2015, with the America’s Cup returning to the site of the original 1851 race. Poor conditions and the cancellation of the second day’s racing failed to dampen the enthusiasm of the crowd of almost 100,000 spectators, including the Duke and Duchess of Cambridge. Portsmouth 2015 saw Land Rover BAR get off to a great start, winning the weekend overall with first place in Race 1 and second place in Race 2. Twelve months later, the America's Cup returned to Portsmouth and Land Rover BAR came out on top once again to put them top of the overall leaderboard. The second regatta of the series saw a new venue in Gothenberg, however it was far from a dream homecoming for Swedish team Artemis Racing, who suffered the ignominy of running aground and damaging one of their foils in Race 1. The Bermuda leg of the America’s Cup World Series was always going to be exciting, as it offered sailing fans an early glimpse at how the venue for the 35th America’s Cup was shaping up. 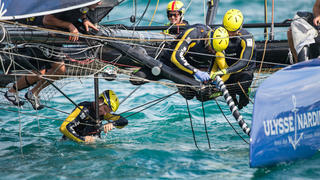 However, a pre-race crash between Artemis Racing and an umpire boat added to the drama. An improvised on-water repair meant that they could take their place on the starting line, and not only that, but the Swedish team went on to win the race and the overall regatta. The Bermuda leg of the America’s Cup World Series was always going to be exciting, as it offered sailing fans an early glimpse at how the venue for the 35th America’s Cup was shaping up. 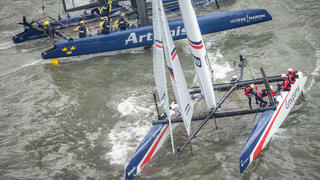 However, a pre-race crash between Artemis Racing and an umpire boat added to the drama. 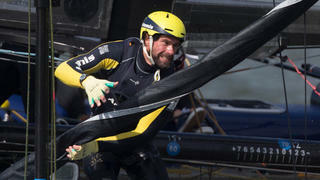 An improvised on-water repair meant that they could take their place on the starting line, and not only that, but the Swedish team went on to win the race and the overall regatta. Groupama Team France skipper Franck Cammas made a successful comeback at the America’s Cup World Series New York, just six months after breaking his leg in a training accident. The veteran French sailor inspired his team to first place in Race 2 and their first overall podium finish of the series. Arguably the most dramatic leg of the America’s Cup World Series took place in Chicago. 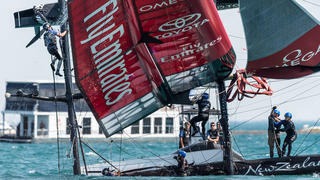 An assembled crowd of nearly 200,000 people saw practice day capsizes for both Oracle Team USA and Emirates Team New Zealand (pictured above) before Land Rover BAR struck the Groupama Team France raceboat on the first day of racing. 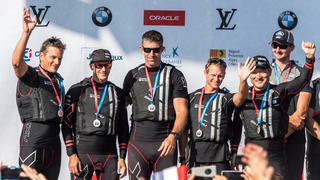 Artemis Racing fared much better at ACWS Chicago, the first freshwater event in the history of the series. The Swedish team won the third race and came second in two others to clinch their second regatta win of the series. Arguably the most dramatic leg of the America’s Cup World Series took place in Chicago. 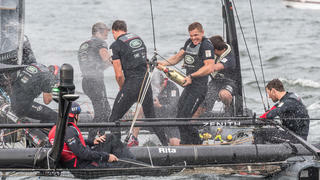 An assembled crowd of nearly 200,000 people saw practice day capsizes for both Oracle Team USA and Emirates Team New Zealand (pictured above) before Land Rover BAR struck the Groupama Team France raceboat on the first day of racing. Artemis Racing fared much better at ACWS Chicago, the first freshwater event in the history of the series. The Swedish team won the third race and came second in two others to clinch their second regatta win of the series. The last two races of the series in Toulon and Fukuoka have seen SoftBank Team Japan emerge as a force to be reckoned with. Led by experienced skipper Dean Barker, the Japanese team have slowly been gathering momentum. Podium finishes in Chicago and Portsmouth 2016 were followed up by a second place overall finish in the French regatta. Although Barker’s team couldn’t top this off with a win in Fukuoka, their improving form makes them a must-watch team in Bermuda next summer. The last two races of the series in Toulon and Fukuoka have seen SoftBank Team Japan emerge as a force to be reckoned with. Led by experienced skipper Dean Barker, the Japanese team have slowly been gathering momentum. Podium finishes in Chicago and Portsmouth 2016 were followed up by a second place overall finish in the French regatta. Although Barker’s team couldn’t top this off with a win in Fukuoka, their improving form makes them a must-watch team in Bermuda next summer.